Nestled in a mile-high valley of the Colombian Andes is the famed 'ciudad' of Medellin. It's almost winter, but the temperature here is a balmy 25 degrees centigrade, as it is most days of the year, a function of equatorial proximity and altitude. 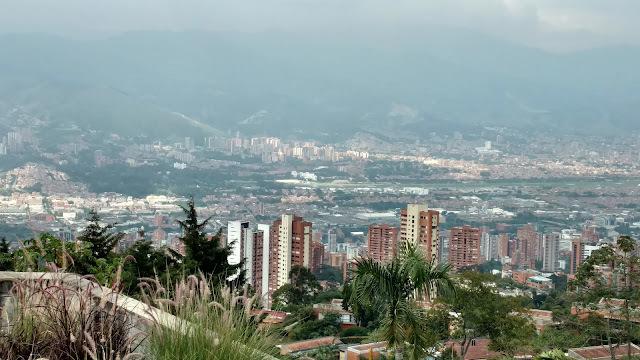 With frequent showers, lush vegetation, and her flowering plants, it's easy to understand why Medellin is known as "the city of eternal spring." 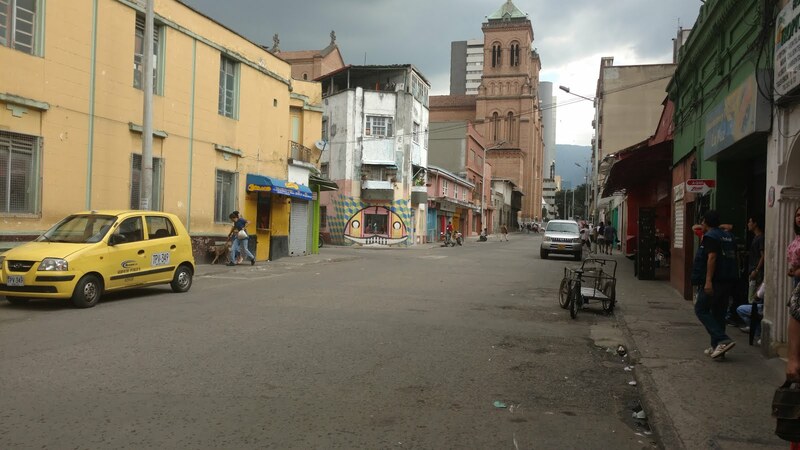 The elite neighborhood of El Poblado, full of bars and restaurants catering to tourists and the city's upper class. I follow a fenced-off pocket of nature down a steep hill, guiding me to one of many small local parks. 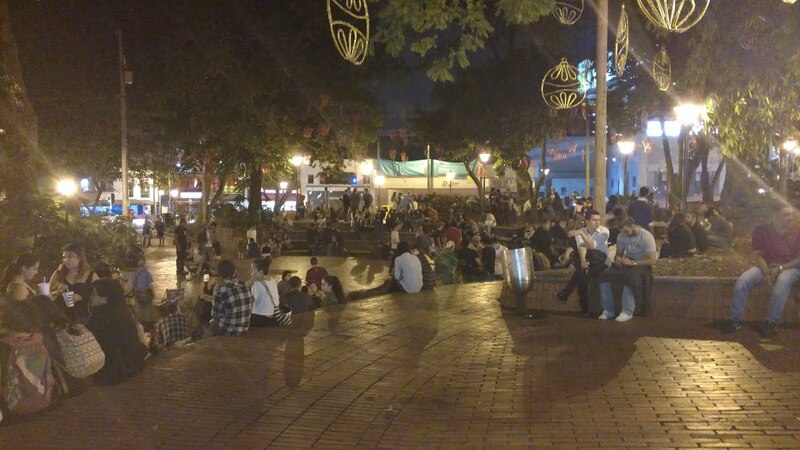 The strong smell of marijuana soaks the air on this muggy evening, as people congregate and chat with their friends. Hot salsa is baked into the genes of Colombians, and it's a staple of the night. Dance clubs populate this trendy area, and the action generally starts late and ends in the early hours of the morning. The artistry and sexiness of the dance in person is entrancing. Board the metro, really an outdoor train, for the bargain price of 67 cents and take it as far around town as you'd like. I stop in the commercial center to explore. 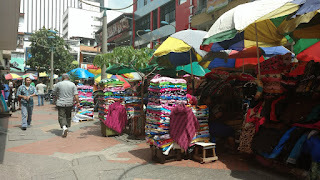 Street markets abound, selling goods ranging from blankets to clothing to fruit and souvenirs. On every corner is a restaurant, bakery, or stand selling donuts, empanadas, or some combination of deep fried/ sugary food to this nation, which in terms of obesity, rivals Louisiana. 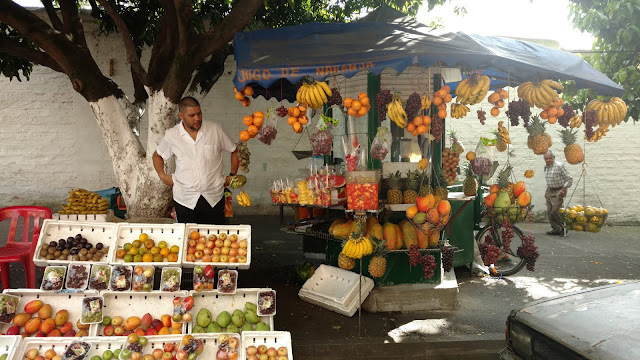 In culinary rankings, Colombian cuisine might very well rank at the world's bottom both health and taste wise, the saving grace being her plentiful and diverse fruit, some of which like lulo and feijoa, most people have never even heard of. Nearby is Botero Plaza, where the nation's most famous artist exhibits his voluminous sculptures. While I can appreciate his artistry, he seems to be mirroring the "growth" of humanity and his fellow countrymen. Regardless, it's a sight to behold and well worth the journey. 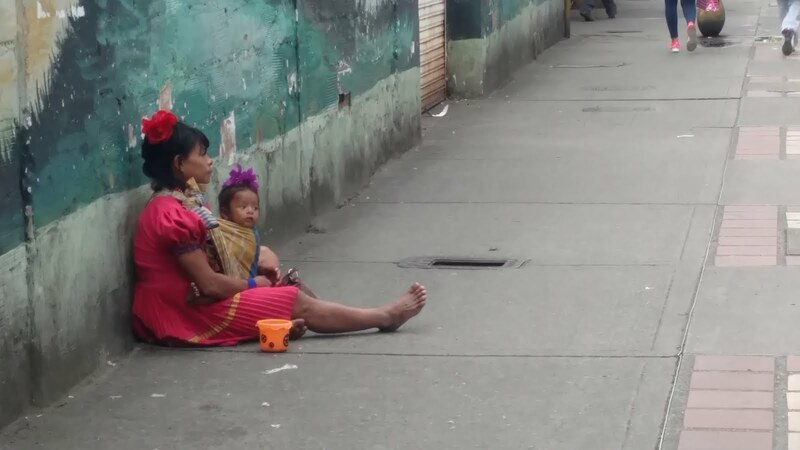 Walk a half kilometer away from the Ministry of Culture and Plaza Botero and you'll find yourself in a rough neighborhood. Male/transgender prostitutes doing their best to imitate the female form walk the streets, aggressively courting clients. 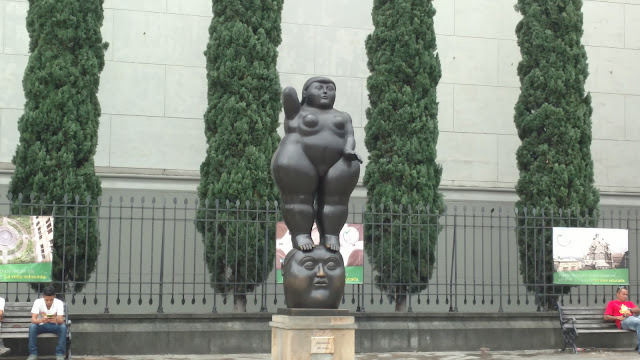 One with gigantic implants follows me for over a block, cooing the whole time at Gringo Rich. Feeling an odd combination of humor and revulsion, I seek to escape the area and re-center myself. 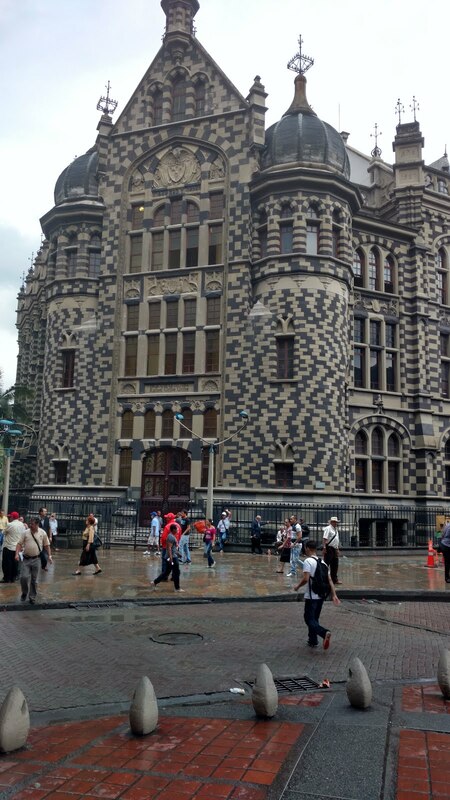 Fortunately Medellin offers me my chance a few metro stops away. 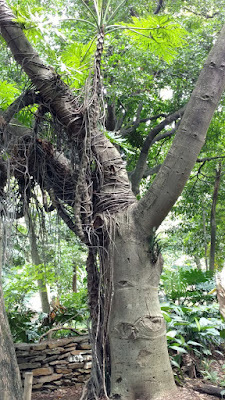 The botanical gardens here are stunningly beautiful, full of large South American hardwoods and palms. 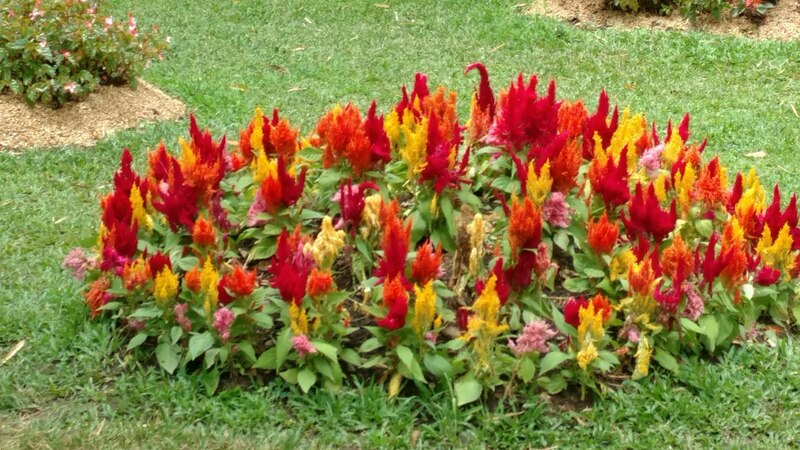 I walk around the park twice, gazing upon the lush beauty of these seemingly sentient plants, breathing in the air, watching the butterflies alight upon bright flowers. 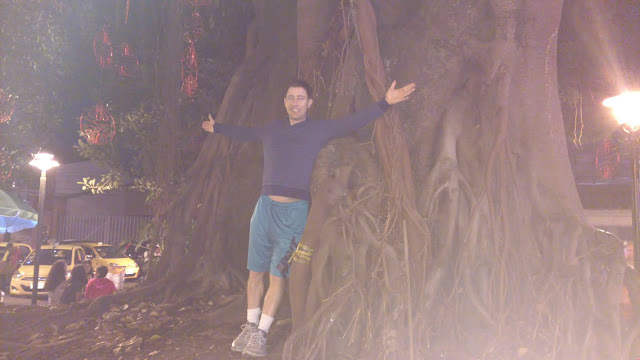 Exiting the gardens, I go and explore the surrounding neighborhoods. The buildings appear to quickly deteriorate in upkeep and value with each step I take up the hill. It's daylight, so for some reason (possibly stupidity) I feel safe to continue my exploration. I find a hard top, one of many around Colombia which doubles as a basketball court and soccer field. Needless to say, in a country where I'm 97 percentile height wise at 5' 10" (178cm,) soccer is the chosen game, and it's played by ages two to ninety. I stop and watch, admiring their nimble foot work. 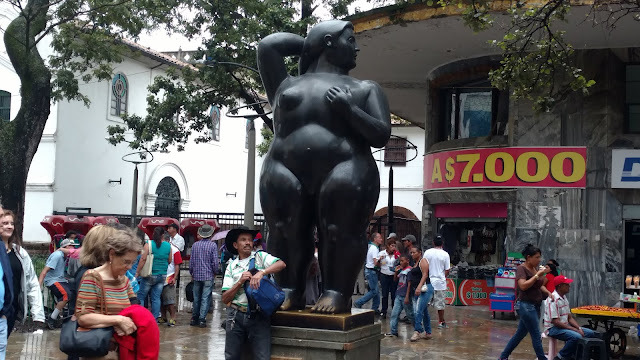 Eventually I return to my lodgings in El Poblado very much in love with this pearl of a city, understanding why her citizens speak of her with such pride. If there would be one place in Colombia I could move to, it would undoubtedly be Medellin. More likely if I was a better salsa dancer.